On February 11, 2015, Mrs. Lina Crocker was joined by several students and faculty on a trip to visit Kentucky’s state capital: Frankfort. 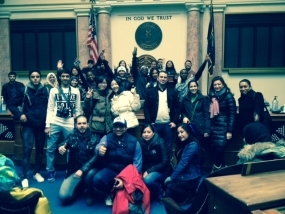 Along with CESL faculty Mr. Keith Gilbertson and Mrs. Susan Ma, the students visited the Kentucky State Capitol building, where they viewed the State Senate chambers, and pretended to be senators. They also had the opportunity to see the Supreme Court Room, This trip gave students the opportunity to learn about the different branches of government, and how each branch operates individually and cohesively with each other. 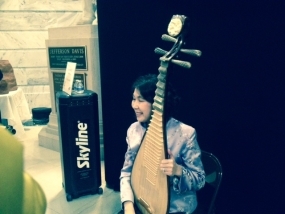 They also enjoyed Arts Day in Kentucky, an event that showcased the work of local artists. The event had more than 300 people in attendance, and provided a great opportunity for the students to meet and learn about artistry within the Kentucky Commonwealth. The students enjoyed lunch at Jim’s Seafood, a family-owned establishment situated right next to the Kentucky River, offering a beautiful view. After lunch, the group went to the Kentucky History Museum which seeks to preserve Kentucky’s history in order to educate people of all ages on the multitude of events in Kentucky’s past through museum collections, oral history interviews, and thousands of reference materials. They concluded the day by meeting with Mrs. Hong Shao, a former CESL student, who played the pipa, (a classical Chinese instrument), for the students. This trip to Frankfort, KY is just one of many organized by Mrs. Lina Crocker in an effort to engage the students in the culture and history of the American Midwest. By conducting these regular outings, students are given the opportunity to take their learning outside the classroom, where they can engage socially with their teachers and peers, giving them a better understanding of American life.